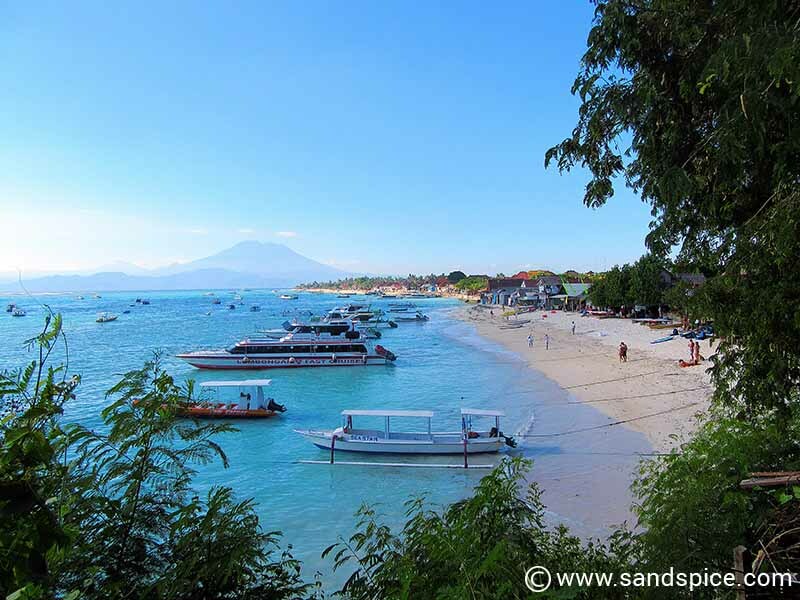 A week on this island is just about the right amount of time you’ll need to visit the main attractions and enjoy most of the popular Lembongan island activities that are on offer. We actually spent 8 days there, and were able to do all the things we wanted at a leisurely pace. From snorkeling to surfing, hiking and river tours, you’ll find plenty of activities to keep you busy. If you’re in a more relaxed mood, the beaches, spas and restaurants do not disappoint. 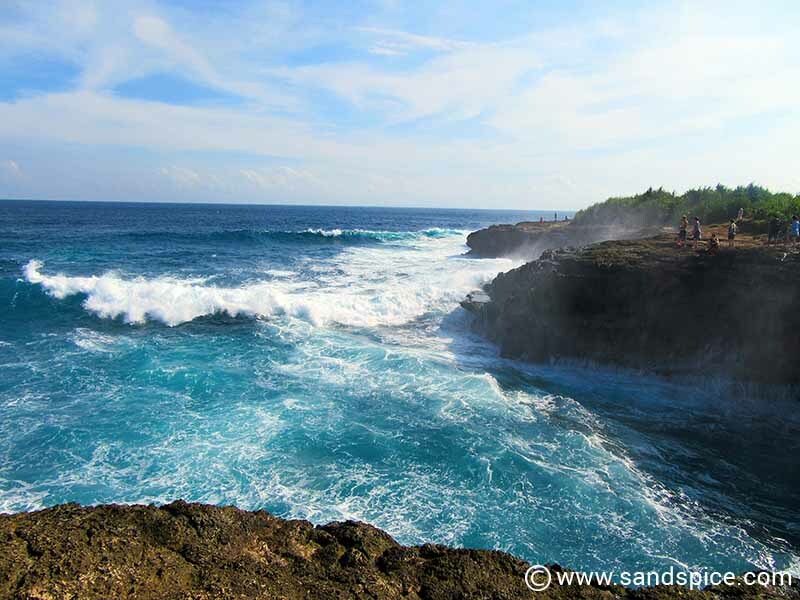 Devil’s Tear is a suitably dramatic name for an equally dramatic natural phenomenon on the south-west coast of Lembongan. Here the tides smash the sea into a cave located on the inside of a steep and rocky inlet. After each surge, the water is forcibly blown out again in a loud and explosive spray – the tears of the devil. 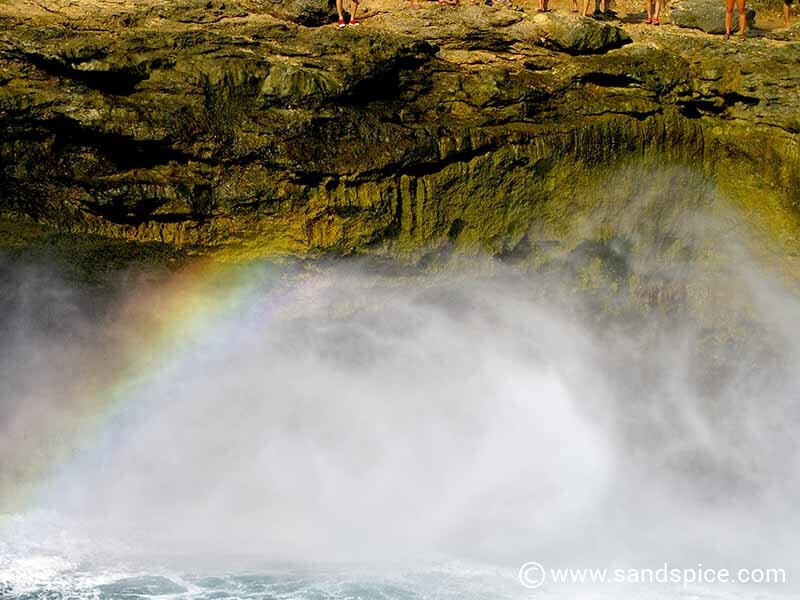 The whole effect is enhanced by the vivid rainbow that is created in the surf. Unsurprisingly, this is a huge tourist attraction. You do however need to take care if you’re attempting to capture the action on camera. This is a wet and slippery area with no safety rails. Over-enthusiastic visitors often get a soaking, or worse can end up slipping down the rocks. Photographers beware – the cost of that selfie could be disastrous. You can find Devil’s Tear in the south of the island between Sandy Bay beach and Dream beach. It’s around a 30-minute walk from Mushroom Bay. In the north of the island, at the far eastern end of the road, you’ll find the entrance to the mangrove forest. If you haven’t pre-arranged a boat trip through the mangroves, you’ll find plenty of hawkers here trying to sell you one. This is quite a busy area, with a number of beach restaurants catering for the large groups of tourists that periodically arrive by bus. 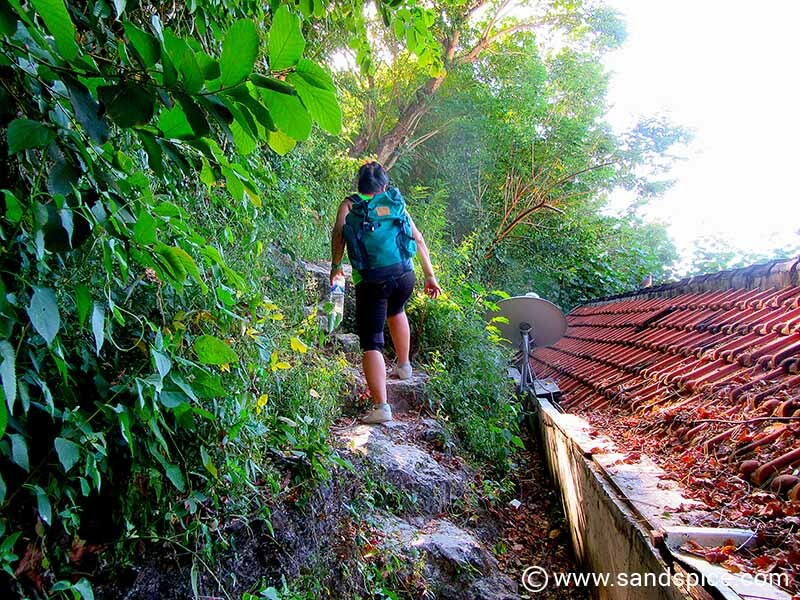 If you’re up for it, you can walk here from Jungut Batu or from the south of the island – it’s quite a pleasant hike if you just follow the beaches around the west coast. 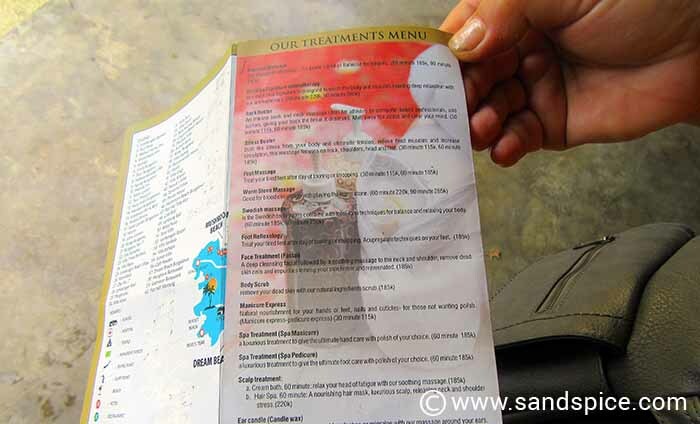 Once there, you can negotiate a price for a trip around the mangroves with one of the local boatmen (or women). These traditional boats accommodate up to six passengers, so its cheaper to travel with a group. 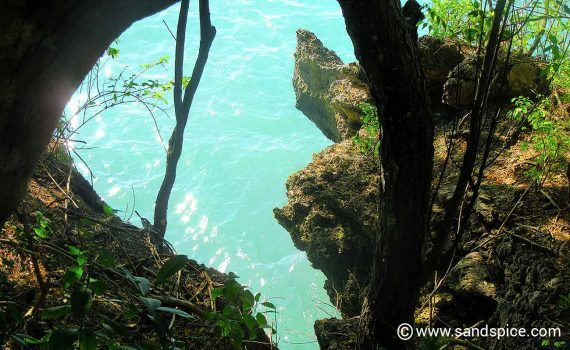 Also on the north coast of the island, not far from the mangrove forest, you’ll find a popular snorkeling spot. The full-day snorkeling trips from Mushroom Beach usually make a stop here, but you can simply find your own way there on foot and swim out from the beach (around 150 yards out). If you don’t fancy the swim, you can hire a boat for an hour from one of the beach bars. The snorkeling here is not terrific, but visibility is good and you’ll see plenty of small colorful fish. 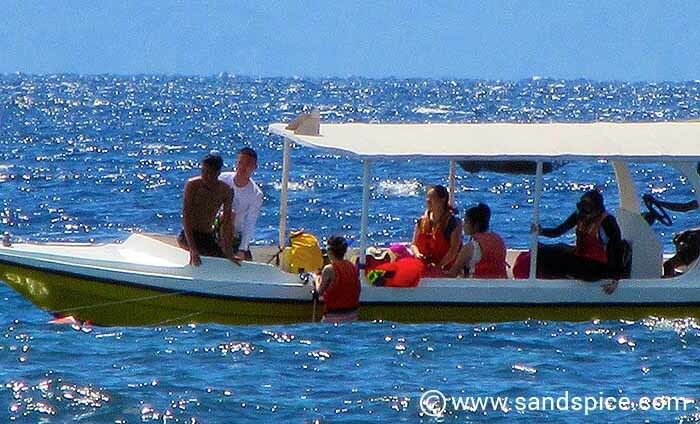 You should also try to avoid snorkeling mid-morning when several large boats arrive crammed with mainly Chinese tourists. They tend to snorkel close together in large groups – wearing life jackets – so you won’t get to see much apart from hordes of flailing legs. If surfing is your thing, then the place to head over to is Song Lambung beach just south of the Jungut Batu fast-boat landing area. 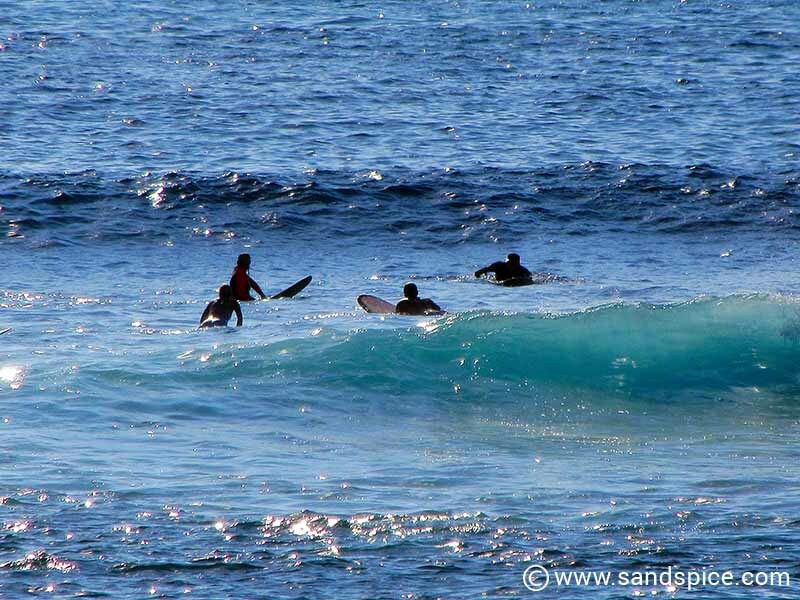 Here you can hire a board and head out into the great blue. 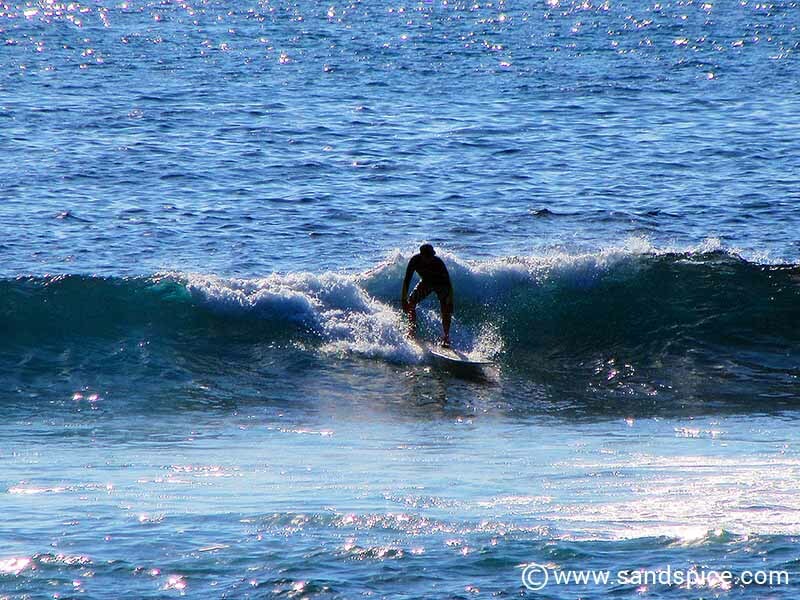 Late afternoon is a great time to be hanging around for the best waves. In fact, there are three popular main breaks, all off the top half of the west coast. These are known (in order from north to south) as Shipwrecks, Lacerations and Playgrounds. They are all not far offshore, and can be reached with an energetic paddle. 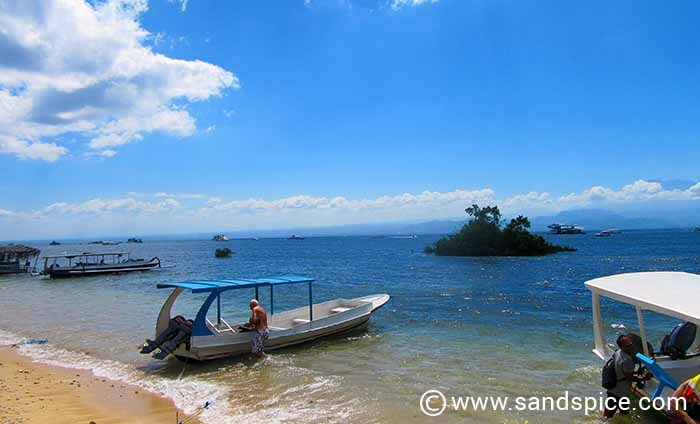 Alternatively, you can just charter a local perahu boat from the nearest beach. 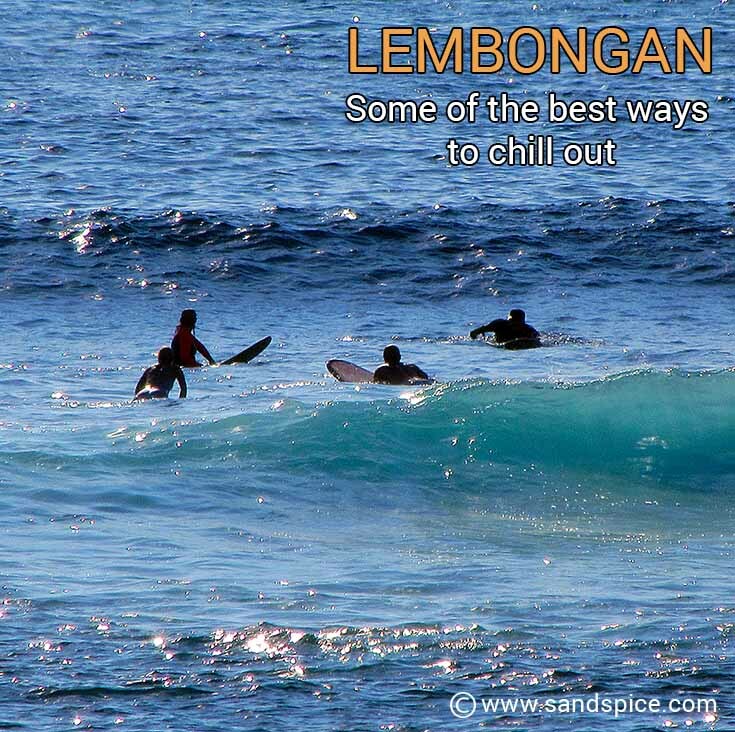 The upper west coast of Lembongan island is where you will find the main stretch. This is a continuous length of sandy beach running for about a kilometer from the boat landing area in the south to Light House beach at the northernmost point. 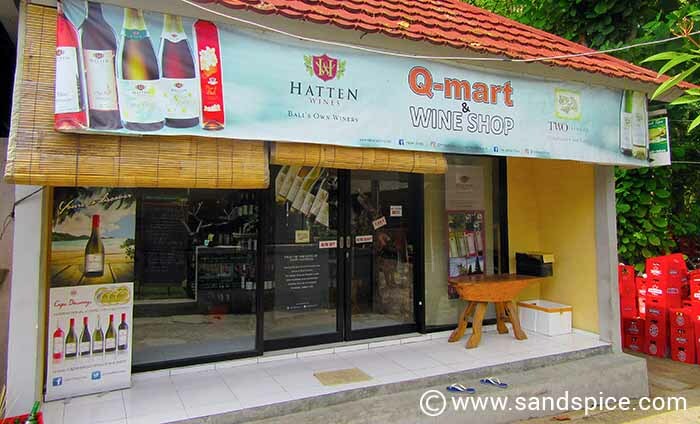 Here you can find most of the shops, bars, guesthouses and commercial outlets, including an all-important ATM machine. 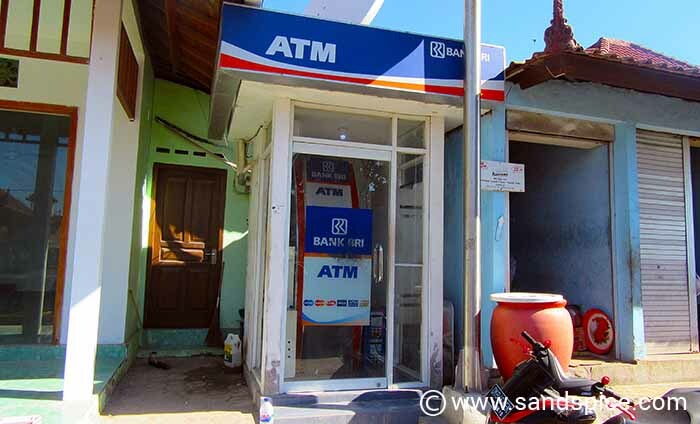 There are only a couple of ATMs on the island, so make sure you top up your cash: They are not always in working order. It’s a pleasant walk up the beach as far as the Lighthouse, where the sand turns a bit shingly (and there is absolutely no shade). From there, you can continue east along the north coast for another kilometer as far as Mangrove Point. Getting around on foot: Discover a useful shortcut! In you choose to get around on foot you’ll see a lot more of the beauty of the island. However, the distances by road between Mushroom Beach in the south and over the hill to Jungut Batu in the north can be a little daunting in the heat of the day. … but there is a very pleasant little shortcut. It runs along the cliff edge between Tamarind Beach (just next to Mushroom Beach) ending at the boat-landing area at Jungut Batu. It’s not easy to find, so you need to ask the locals. It saved us a lot of time and effort travelling up and down the island. 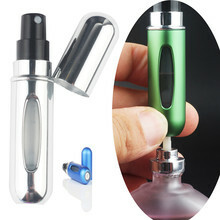 It took us a few days to find shops selling the products we required at the right prices. For bottles of spirits we found a shop close to Sandy Bay, and another in Jungut Batu (see Lembongan Island Eating Out). There’s also a good shop on the Jalan Raya Tuban which sells small Schweppes tonic waters for IDR 8,500 (€0.50) a bottle. You’ll find spa boutiques all over the island, with lots of different treatments. A typical one-hour session will cost around IDR 270,000 (€15). Of course, if you just want to chill out there’s a good selection of soft sand beaches dotted around the island, and some interesting offshore snorkeling locations that you can reach by boat. Although it’s tempting to stick to the beach closest to your guesthouse, you can find more secluded swimming locations if you scout around a bit. This is also a good way to discover some of the less expensive and good quality eating venues on the island.